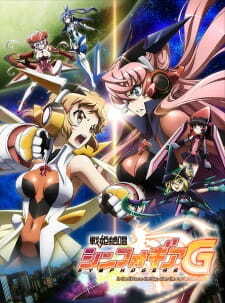 If you’ve watched the first season of Symphogear then you have a good idea of what to expect from this series; which means what you experienced during the first season, is pretty much what you’ll experience with its second season. The visuals are far more consistent than they were before, there will be no scenes with absolutely atrocious animation or badly drawn faces, and all the fights are competently done. The backgrounds lack detail, they are usually completely bare and do not present anything eye-catching. The character designs for the girls are diverse and have a lot of charm, whereas those for everyone else have much less thought put into them. Which is unfortunate as you’d expect the art to step it up, even just a little bit whenever they make a second season of anything. The soundtrack also is an improvement upon the last season, there were a couple of insert songs that may catch your liking, both of which were sung by Takagaki Ayahi, the seiyuu for Chris, who is by far the best singer in the cast. The lyrics for the songs are incredibly cheesy and are often funny because of that, they rather fit into the spirit of the show. The characters are much more likable this season, and the developments of the characters are markedly better than the random character developments of the last season. The characters are really weak, however, despite this, they are still quite endearing. In all, they are much like the show, really poorly written and lacking any depth. Sadly, they lack the depth to leave a lasting impression. Additionally some of the characters still manage to be annoying on occasion, however, those events are few and far between. The plot is disappointing the sense that it does not reach the ludicrous moon-shattering events of the first season, it does somewhat make up for it by being much more cheesy. For one it managed to make the fairly simple plot into something unclear; half the time you do not know what is going on. Some plot twists were introduced sporadically and do not play a big enough role for the Anime. These plot twists are lackluster due to the fact that they generally get resolved rather quickly. The antagonist is also an atrociously written character, his motives are cliché, and his personality is one dimensional. So to summarize Symphogear is still a very poor show on paper, and if you can’t ignore bad writing and other unneeded things, then I do not recommend this show. Having watched the first season you should know well by now whether you will be able to enjoy the show or not even if this season is considerably more enjoyable. Anime Review, Opinion, Worth Watching?